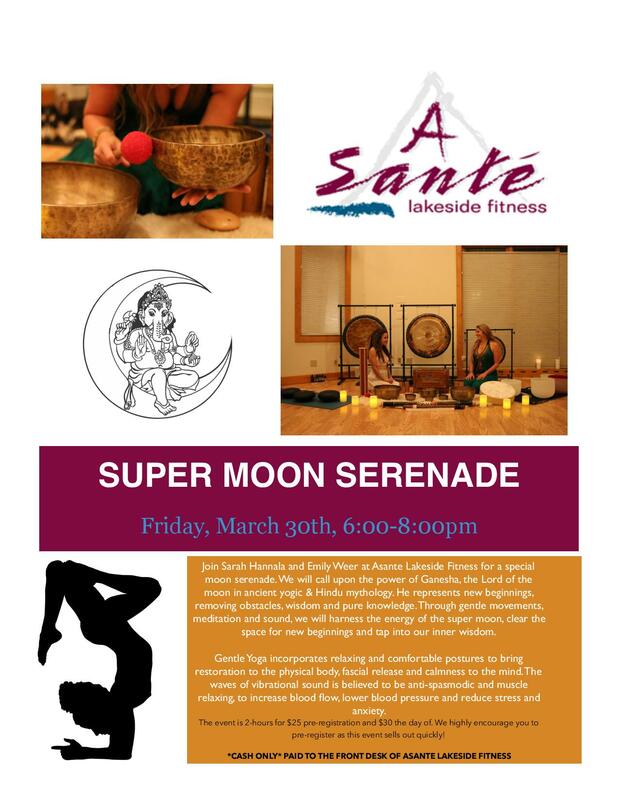 Join Sarah Hannala and Emily Weer at Asante Lakeside Fitness for a special moon serenade. We will call upon the power of Ganesha, the Lord of the moon in ancient yogic & Hindu mythology. He represents new beginnings, removing obstacles, wisdom and pure knowledge. Through gentle movements, meditation and sound, we will harness the energy of the supermoon, clear the space for new beginnings and tap into our inner wisdom. Gentle Yoga incorporates relaxing and comfortable postures to bring restoration to the physical body, fascial release, and calmness to the mind. The waves of vibrational sound are believed to be anti-spasmodic and muscle relaxing, to increase blood flow, lower blood pressure and reduce stress and anxiety. The event is 2-hours for $25 pre-registration and $30 the day of. We highly encourage you to pre-register as this event sells out quickly!